Despite his long absence from the cage, Jon Jones had all the tools required to dispatch his rival Alexander Gustafsson and reclaim the UFC light heavyweight title in the UFC 232 main event on Saturday night. And thanks to former UFC lightweight and featherweight champion Conor McGregor, he also had the tools required to properly celebrate: a few bottles of the Irishman’s popular Proper No. Twelve Irish whiskey. That’s according to Yahoo! Sports reporter Kevin Iole, who says Jon Jones told him Conor McGregor sent him a few bottles of the whiskey. 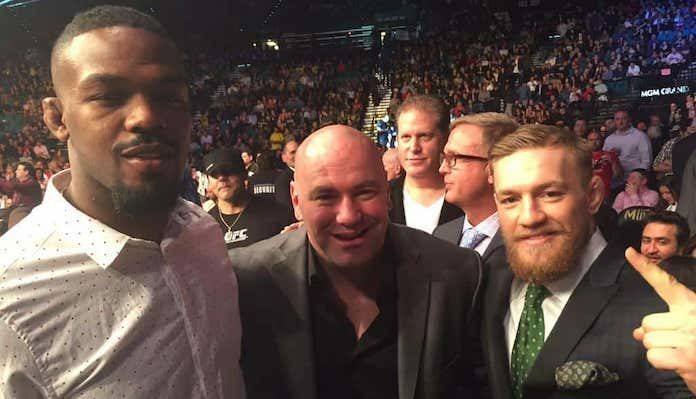 “Ran into [Jon Jones] in the hotel lobby and he said [Conor McGregor] sent him and his team a bunch of Proper 12 whiskey,” Iole wrote. When a fan replied that Jones should not be associating with Conor McGregor, who has endured his fair share of troubles outside the cage this year, McGregor clapped back with a clever response, but promptly deleted it. “I prefer the term ‘influential’” McGregor said when a fan said he was a bad influence. With his victory over Alexander Gustafsson, Jon Jones is now an incredible 23-1 (1) overall. His lone loss came via disqualification, when he landed several illegal elbows on Matt Hamill in 2009. Since then, he’s bested world class foes like Brandon Vera, Ryan Bader, Mauricio “Shogun” Rua, Quinton “Rampage” Jackson, Lyoto Machida, Rashad Evans, Vitor Belfort, Chael Sonnen, Alexander Gustafsson (twice), Glover Teixeira, Daniel Cormier, and Ovince Saint Preux.